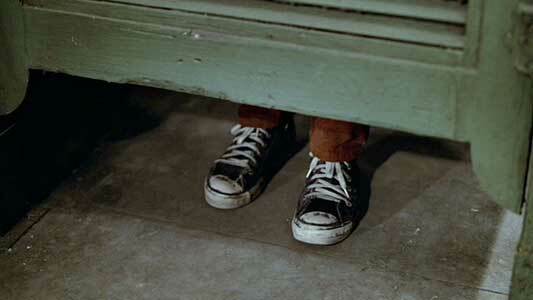 Marcelino Sanchez and many others wear black high top Converse “Chuck Taylor” All Stars in the film. The Warriors are trying to return home after the gang meeting. There’s a one-night truce between the many colorful gangs of New York City as they all gather to hear Cyrus, president of the Gramercy Riffs, the city’s biggest gang. He explains to the masses that their combined tens of thousands greatly outnumber the city’s few police. One gang could run the city. He proclaims, “We got the streets suckas! Can you DIG IT? !” Cyrus is assassinated by extremely high-strung maniac Luther (David Patrick Kelly, Sully from Commando), leader of the Rogues. He then perpetrates the myth that the killing was done by The Warriors. The truce, obviously, is broken. Falsely accused of assassinating Cyrus, they are on the run from every other gang. 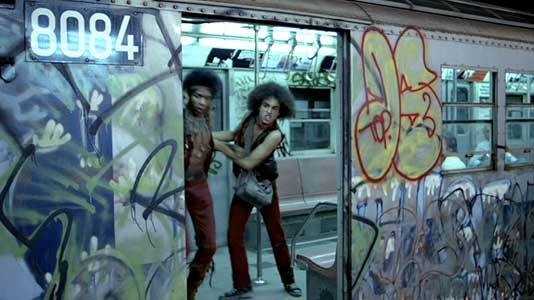 The Warriors, a group with a sort-of Native American theme, try to get back to their turf on Coney Island, on the other side of New York City. 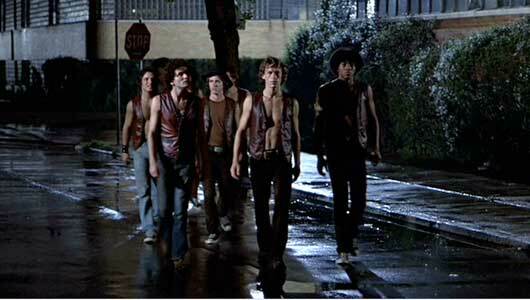 After their leader, Cleon (Dorsey Wright), disappears, the Warriors are led by Swan (Michael Beck, next in Xanadu). The entire way, Ajax (James Remar) is obstinate because he wants the mantle of War Chief. The gang gets split up. With every gang out to kill them, fight after fight ensues. Each gang’s more insane and theatrical than the last. They face the Orphans, the all-female Lizzies, the roller-skating Punks and, best of all, the Baseball Furies! Along the way, Swan meets Mercy, a young prostitute. She wants to live life now. He’s getting tired of fighting and wants to escape. They’re both filled with unspoken angst and longing, and over the night naturally gravitate toward each other. In the end, the Warriors and Mercy make it to Coney, where they’re confronted by Luther and the Rogues. Luther clinks bottles together noisily and famously taunts, “Warriors! Come out and PLAY-AY!” Fortunately, the Riffs have caught wise and intercede. The Warriors have clear passage. Several Punks are waiting to attack the Warriors. The Warriors is an odd film. It’s deadly serious in its look and it’s violence. 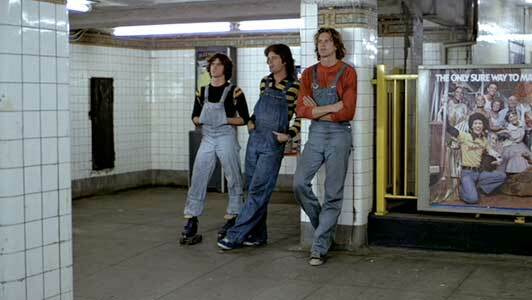 On the other hand, the idea is inherently campy and the style so distinctly late 70s it plays as twisted fun. The younger generation has embraced it as the latter, celebrating it as cheese. There’s even a 2007 video game. The plot is simple, even classical. It’s based on the Greek story “Anabasis”. There’s nothing more timeless than heroes just getting into violent fights with enemies. The film succeeds in drawing you into its suspense. Sure, they’re violent rascals but they’re innocent and just trying to get home. It’s accessible to anyone. It’s solid and has conviction. Best of all, it has exemplary style. 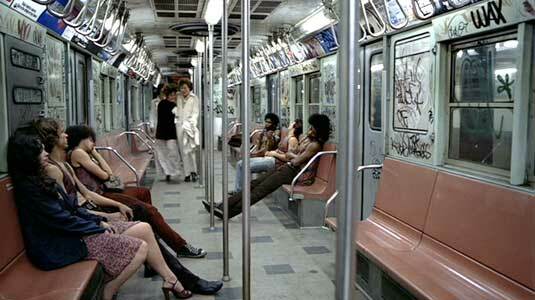 The New York that this is set in doesn’t exist anymore, so it might as well be set on an alien planet. Criticisms are that it meanders in the middle and really has nothing to say. The violence may turn some off. Most of us like it, though. Ultimately, it’s timeless. Exhausted, a couple of Warriors lounge on the subway. Rembrandt shows his chucks to lure the Punks into a fight. The gang’s youngest member Rembrandt (Marcelino Sanchez), who wields the spray paint, wears black chucks. In the subway bathroom fight with The Punks, he steps down in the stall, showing his chucks to lure them in closer. The Punk that opens the door gets red paint in the face but good! The Warriors. (1979) Michael Beck, James Remar, Marcelino Sanchez, Dorsey Wright, Brian Tyler, David Harris, Tom McKitterick. Directed by Walter Hill. Categories: Drama, Action/Adventure.